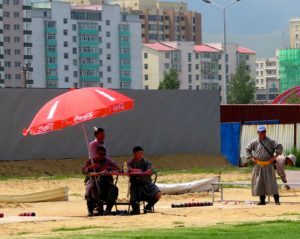 Archery is one of the three big sports in Mongolia and I was anxious to try it. After visiting a Buddhist Temple in the city center we happened on an archery tournament. Watching from the fence it was obvious that the target was a ball on the ground and not an elevated bullseye. Each archer would shoot 8 arrows at the center ball before rotating turns. The best out of 64 would win. Not only was the competition impressive but the outfits the athletes w ore were just as fascinating. 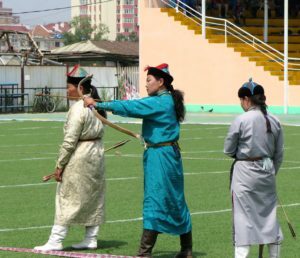 Mongolian clothing can be divided into three categories: everyday, ceremonial and official clothes. 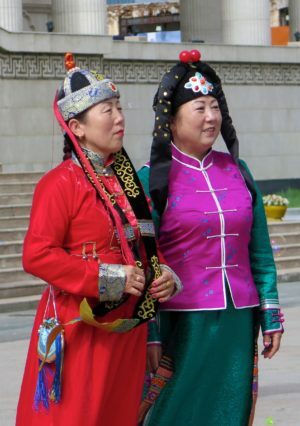 There are 20 ethnic groups in Mongolia and each group has its own traditional clothing and ornaments. Clothing and jewelry reflect things such as history, relationships and age. 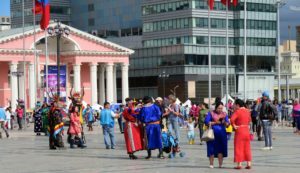 I was fortunate to be there when a national event was taking place in Ulaanbaatar’s main square. 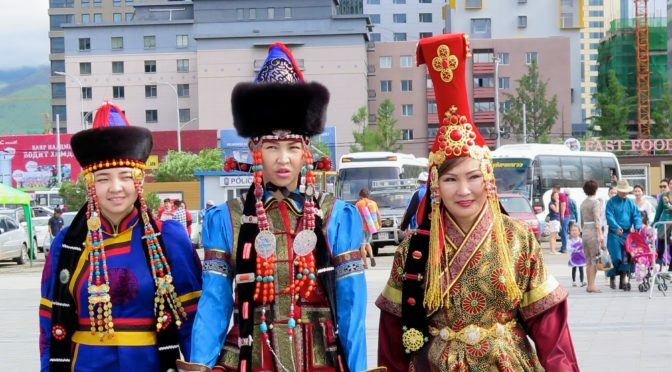 Mongolians from all over the country attended in traditional dress proudly representing their region. 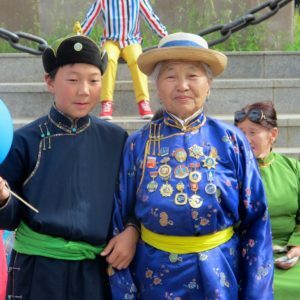 In the closet of most Mongolians a del hangs and on an ordinary day the elderly can often be seen in this wearing this article of clothing. A del is the length of a trench coat, it has a high collar with buttons on the right and the fabric slants across the chest. The lower part of the slant is loose and acts as a pocket to store and keep warm everything from food to children. The sleeves are long with wide cuffs that unfold to cover the hands when holding reins in cold weather. 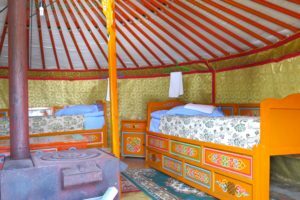 It was hot when I was in Mongolia and this made my two-day stay in a ger (click here for more about a ger) comfortable. We didn’t have to light the stove and suffer with the smoke in exchange for warmth. The ger was located in Terelj National Park. This park is only a couple of hours outside of the city and worth the visit. The park was made up of unique rock formations and green valleys being grazed by livestock. A hike to the local Buddhist Monaster y entailed a climb up and over a mountain that offered sweeping views of the valleys below. It was at the park where I was able to experience archery for the first time. 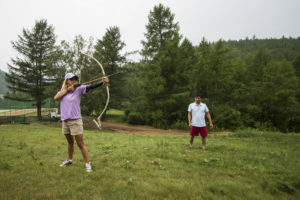 Having dominated a friendly competition, where the target was eye-level and not on the ground, made me want to look into a place to learn archery when I return home. 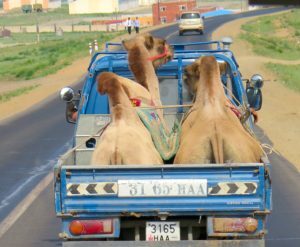 Mongolia was unlike any other Asia country that I have been to. It just felt and looked so different. The culture, the people with their interesting religion and superstitions made it a magical place for me. 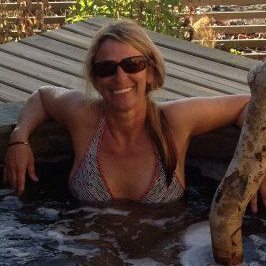 One that I not only want to return to but a country that has moved into a spot on my top five countries that I would highly recommend. 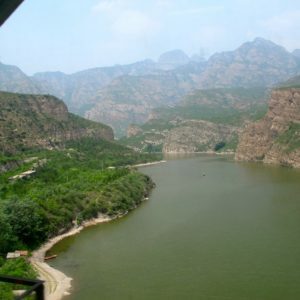 As the train left behind the mountains and gorges just outside Beijing, China the view from my seat at the window seemed to suddenly change. We were in the Gobi Desert. 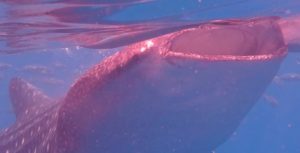 Perhaps the difference in landscape, the gravel plains, seemed so abrupt because it was separated by the cover of darkness. The dust that blanketed our 4 person sleeper only confirmed that our trip through the northernmost desert in the world continued throughout the night while we were asleep. As we traveled closer to the interior of Mongolia the panorama was spectacular. The rolling hills and the endless flats of the prairie were deep green. 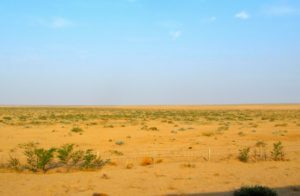 The grasslands appeared to have been perfectly mowed and they had been by a rotation of livestock that roams this part of the world. 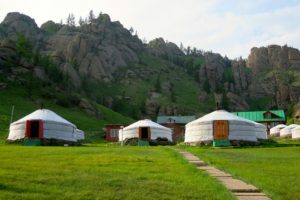 Mongolians are nomads and the white round structures that dot the scenery are the gers they live in. 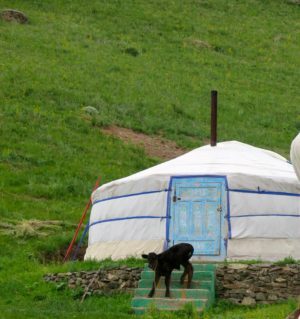 A ger in the west is known as a yurt. It is a lightweight collapsible structure that is easy to move. It is made of thick layers of felt and has a stove in the center that acts as a heater during the cold season. 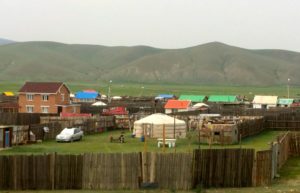 Many families continue to live in gers that they set up throughout the Mongolian Steppes where their herds of livestock graze. In 2015 Mongolia counted its animals and livestock and found 55.9 million in the country which included over 3.2 million horses, thus the number of horses in Mongolia are nearly the same as the population. 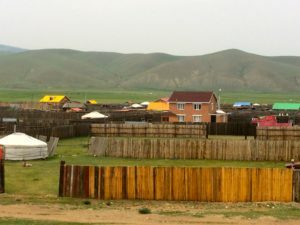 As the train neared Ulaanbaatar, the biggest city in Mongolia, the green grassland and the white gers fight for space with permanent structures. Thankfully after 30 hours the view from the window hasn’t lost its appeal, the homes that line the hills are painted colors of a rainbow. 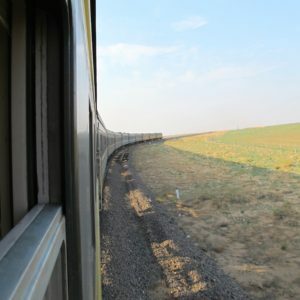 I have a good feeling about Mongolia and I can’t wait to get off this train so I can get personal with this place. As I zigzagged through the Disney-esque immigration line marked “Foreigners” I thought with a smile I’m in China. A country which for some reason has never made it on my must see list. 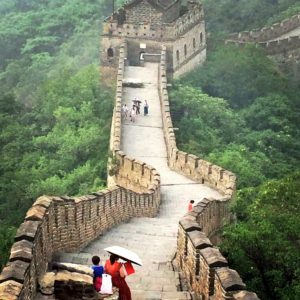 If it wasn’t for my desire to ride the Trans-Siberian Railway, I am not sure I’d ever get around to visiting Beijing. It was no surprise that Beijing was a big crowded yet very clean city. 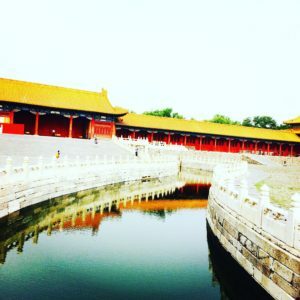 I saw the sights that in picture form always accompany articles where the words China and travel are found in the same sentence: The Forbidden City, The Great Wall of China and an acrobatics show. Each was much more impressive in person than in print. And of course I went to Tiananmen Square, a place my guide left recent history out of his lecture on all the important events that took place in the square. After a few days of sightseeing, sampling the local cuisine and elbowing my way onto the user friendly subway I was ready for what I expect to be the highlight of this trip, Mongolia. The modern Beijing train station is where I embarked on the first leg of my journey by boarding the Trans-Mongolian Railway. 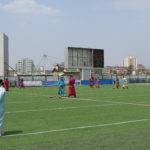 The trip was to take about 26 hours before arriving in Ulan Bator. 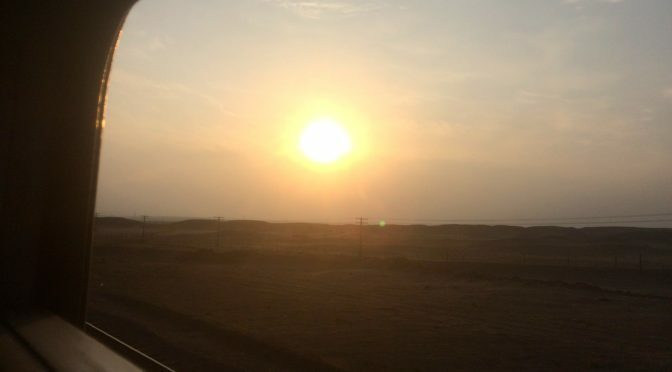 The sun was just above the horizon when the train stopped at the first platform of the new day. All the passengers were still in their berths. 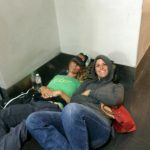 I assume they were asleep; about 6 hours before we went through an eventful border crossing that entailed more than just a passport and visa check. 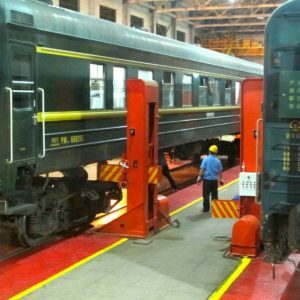 The wheels on the train needed to be changed because in Russian the railroad line is wider than the tracks that took us through China. After three hours at the border we finally left China in the dust, literally. The platform where I am now standing was the beginning of this adventure to the country I have been anxious enough to wake up early. Alone I stood watching the sunrise over Mongolia. 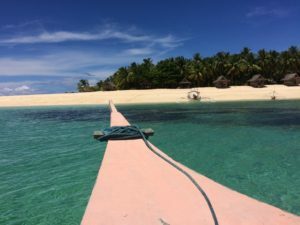 As I left Malapascua Island by boat I took one last look at the beauty that surrounded me. It was the perfect closing shot to an amazing month in a country that for some reason I appreciated more with each passing day. 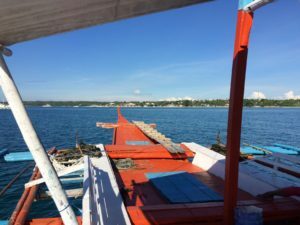 The deck of the banca with its bright orange paint and its multicolor outriggers glided over the translucent blue sea as we headed for the neighboring island where the airport is located. From the boat there was no mistaken the rich green of the palms fronds covering the inland and the line of white from the sand on the shoreline where we were headed. Soaking this in I thought to myself how the Filipino people were just as warm and colorful as the inviting islands they lived on. I met a lot of wonderful locals, travelers and expats. Whether it was drinking a glass of beer with my Filipino friend in front of his home with its metal walls and roof that didn’t properly align or sharing a meal with my new friends from Australia or Holland I enjoyed every moment. There was rarely a day that didn’t involve a trip on a boat and a dip in the sea, two of my favorite things. I know there are at least 6995 islands of the Philippines I didn’t get to see but it is unlikely that I will return thus I am leaving with a heavy heart. I gave my fins and rash guard to a young boy on the Island since I won’t need them where I am going. 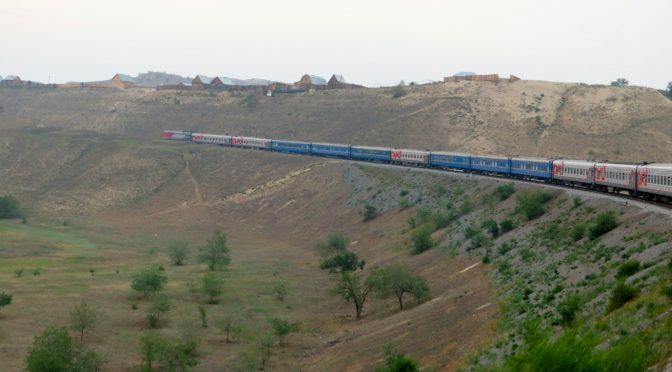 Tomorrow I head to Beijing where I will embark on a Trans-Siberian railroad trip. What a difference a day will make. I knew the minute I stepped off the boat that I was exactly where I was suppose to be. I often say I can feel the soul of a place the minute I arrive. As with many first impressions they are not always accurate but this time my intuition was spot on. I love this island. 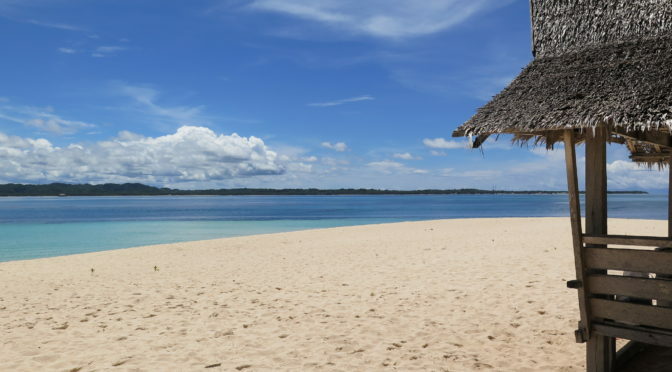 Yes I said I could live in Siargao but for vacation this island in the Philippines is what I would call paradise. It’s quiet and quaint. There are no cars because the dirt and sandy roads are really narrow alley ways. Just off the beachfront there is a small village. The locals here are very friendly and walking alone even in the dark one still feels safe. I should know I got a bit lost last night. 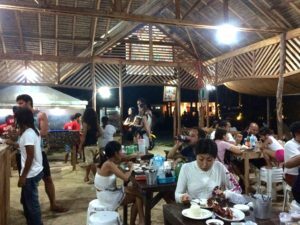 Although Malapascua is a tiny idyllic island there are just enough restaurants for variety unless you repeatedly extend your stay. I’ve only extended my stay once. I planned for 3 nights but I’m now staying for 5. Good thing I came here last and I have a pre-booked flight or I would have had a very hard time getting off this island. It’s hard to resist good diving and a hotel where you have to enter from the beach. I can’t leave out the sunrises, no the sunsets, actually both are incredible even on a cloudy day. Thankfully it was worth the 2 hour ferry trip then the 3 hour cab ride and the last leg, a half hour Banca boat ride. 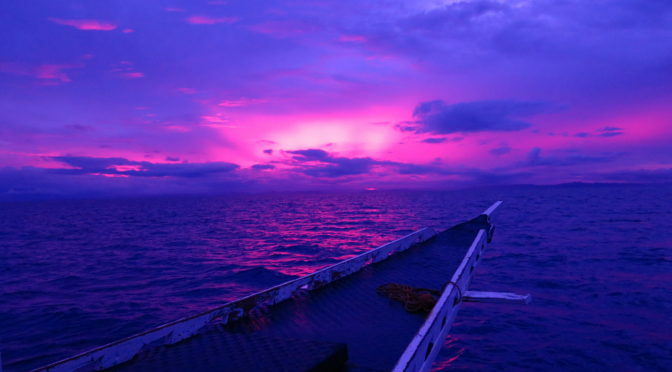 Bancas are traditional Filipino boats. They have large outriggers made of bamboo but no sails, a very loud motor powers the boat. I hadn’t planned on the cab but when I asked to go to the bus station the driver offered me a deal I couldn’t refuse, about 30 bucks less than the hotel quote for a private ride. I didn’t hesitate because at times comfort and convenience are worth that extra expense. This island is so perfect to me in hindsight I would have walked just to get here. Ok maybe I would not have walked but definitely hitchhiked. As a shark started circling I felt a tug on my BCD (vest that the tank is attached to) it was the dive master. I don’t know if he grabbed me for safety reason, to keep me still or to make sure I didn’t get any closer. Whatever the reason was I didn’t care the sharks didn’t seem interested in us plus I knew I was in good hands. 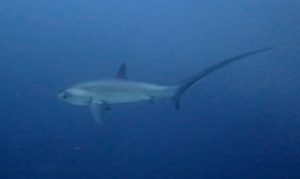 Thresher Sharks are also known as “fox sharks.” Their tail-fins can be longer than their body and they use it as a weapon that can be as deadly as their teeth. Waking up before the sun is the only guarantee to see the Thresher Sharks as they swim through the cleaning station. 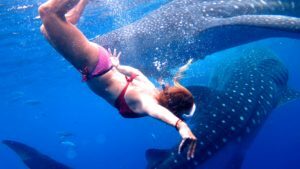 Here they say that Malapascua Island in the Philippines is the only place you are guaranteed to see these sharks all year long. 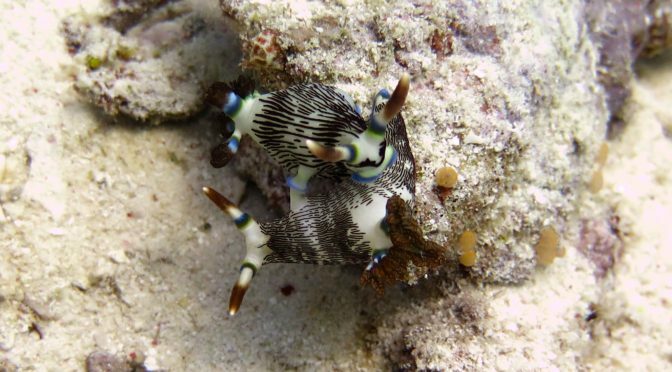 I went on two dives and both times I had the pleasure to see these beautiful creatures up close. Today’s dive was just plain awesome. We saw a few sharks swim by when we were down 31 meters (101 feet). 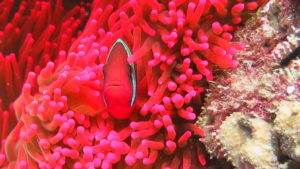 Being down so deep a diver can only remain a short period of time. After a few minutes we made our ascent. 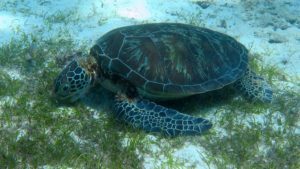 As we were headed for shallower water I heard the dive master grunt. I turned in time to see him point to nothing but wide-open blue water as he put his other hand over his forehead making the shark sign. Of course I had been taking pictures of the colorful starfish and apparently missed another shark swim by. I thought to myself oh well at least my dive buddy saw it. Unbeknown to me we started swimming in the direction the shark took. At 15 meters (49 feet) we found another Thresher. This one also decided do a few laps in front of us. (There’s video on the FB page) I wasn’t nervous at all; to me it felt as if the shark knew it was being admired and it wanted to show off a bit. 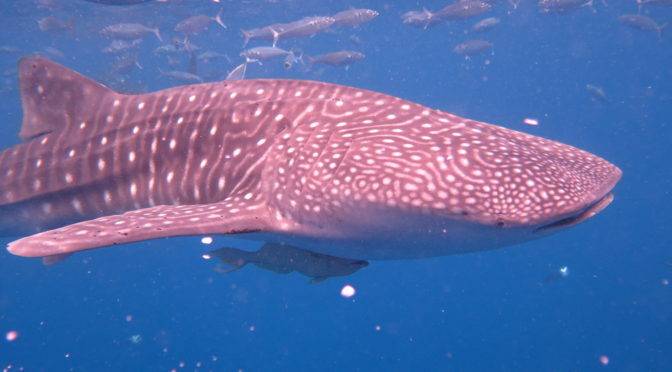 I finally saw a whale shark, which would never have happened if my flight wasn’t canceled. Thank you my travel gods. The whale sharks were amazing. They are so huge and graceful. Truly gentle giants. 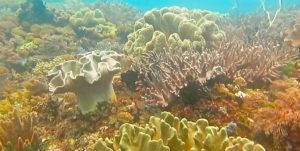 I don’t know what I was thinking by booking that flight other than Apo Island is suppose to be one of the best dive destinations in the Philippines. But it’s shark week or so I read somewhere that it was. In honor of shark week I decided to skip Apo Island (plus I’m not in the mood to deal with rustic) and head to Malapascua Island instead. Once I pulled my head out of the sand, I realized I have to go there before I leave. 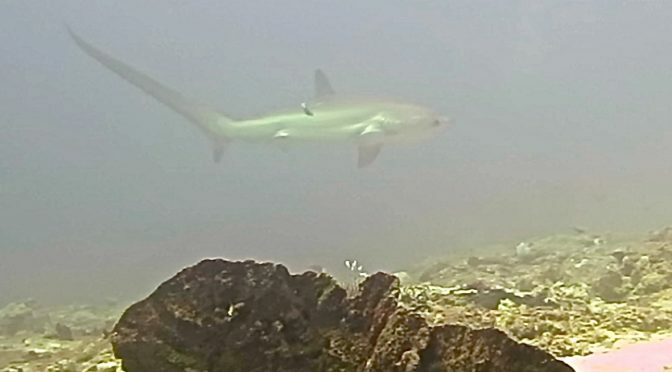 This could be my only chance to see a Thresher Shark. 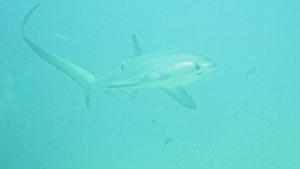 Three weeks ago I didn’t even know what a Thresher Shark was and now I hope to see at least one. Plus it’s about time I spoil myself with a fancy place to stay. I’m going upscale splurging in the Philippines for a $55 a night room and that’s the promotional rate. Hopefully it will all be worth it and I will be posting shark pictures soon. Next up Malapascua for shark week! 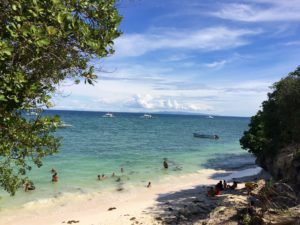 The first thing I noticed when I arrived on Alona Beach on Panglao Island were all the tourists. The beach is littered with places to stay, eat and shop. At first glance it was a big disappointment after coming from Siargao. 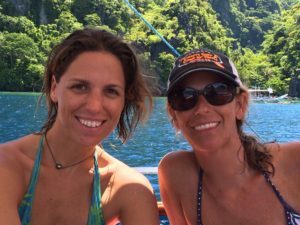 I found my two Aussies friends in the hotel pool and over a drink we discussed that we were afraid we had already experienced the best island in the Philippines. That was until I saw what was under the sea. Wow, the plethora of dive shops now makes sense to me. 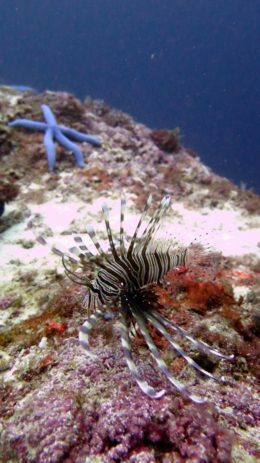 I knew the diving here was suppose to be among the best in the Philippines but I heard that before so I wasn’t expecting much. 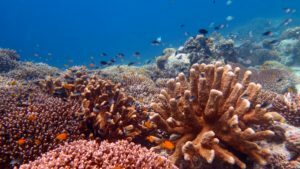 I thought with all these people the reef can’t be healthy. Wrong again. I love to be wrong about things like this. The diving was great! 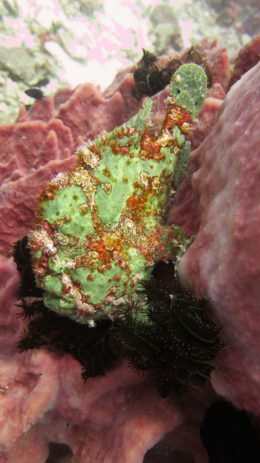 Sea turtles were everywhere and the frog fish, clownfish and nudibranchs come in all different colors. 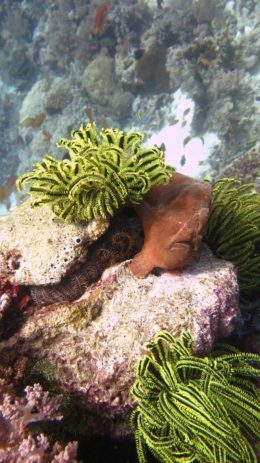 Eels, snakes, coral of all shapes and sizes it is just beautiful. (I’ll post more pictures on the Facebook page when I get a chance) The only thing missing was my brother, he’s my dive buddy back home. 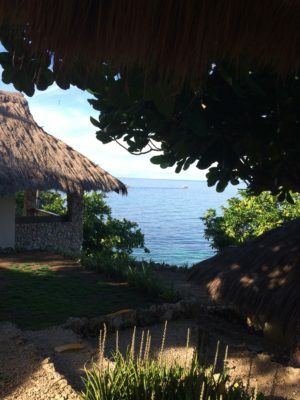 Last night I thought I was going to make a quick escape from Panglao but after today, well I just extended my $23 a night room for two more days. 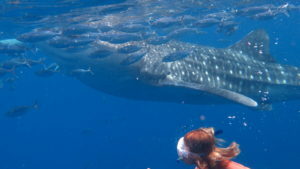 Tomorrow’s plan involves snorkeling with the whale sharks. I couldn’t have planned a better start to my summer trip. My dear friend from Brazil helped me start the summer with a blast but n ow she is gone and it’s solo until I get to Europe in August. The big bummer about traveling solo is that I have to pay close attention to everything. With my travel buddy she was usually on top of everything so I could defer to her. Although I was in charge of our slush fund (aka slushie) a fair amount of time. 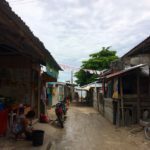 I have 9 more days left in the Philippines. My plan is to hit a few of the dive spots. 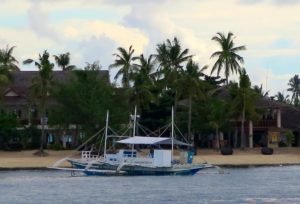 The morning started with a very early flight to my original destination, a small island south of Cebu, but the cancelled flight changed that plan. I didn’t mind the airline gave me 500 pesos for travel, a free flight and a refund for my ticket. Luckily I had no place to be unlike the very angry people who were told the next flight to Dem didn’t depart until tomorrow. 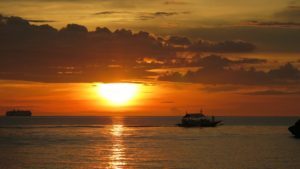 I spent my 500 pesos ($10.74) on a cab to the port and a ferry to Bohol. I just reversed my trip or who knows maybe I will find a live aboard dive boat to spend a few days. My new Aussie friends are going to be very surprised when I show up at the hotel, I told them to stay at, on Alona Beach. This is why I don’t make reservations it’s so freeing not to care. I can’t see all 7,000 + islands in the Philippines so I’m going where the travel gods take me and today instead of Apo Island it’s Panglao . How is that for an endorsement? 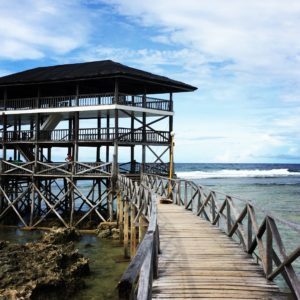 General Luna in Siargao (Shar-gow) may be known for it’s surfing, thanks to the Cloud 9 break, but it offers so much more. This place where the surf culture intersects with that of the Siargaons just works. 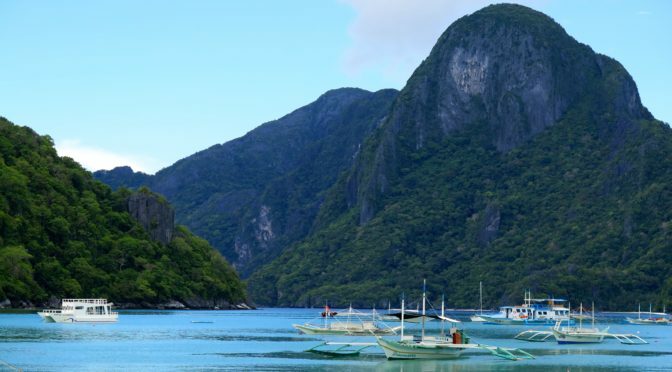 Minutes before reaching this coastal town with its clear blue sea you will pass by the lush green rice fields. 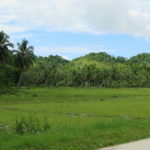 The vibrant colors in Siargao don’t stop there. 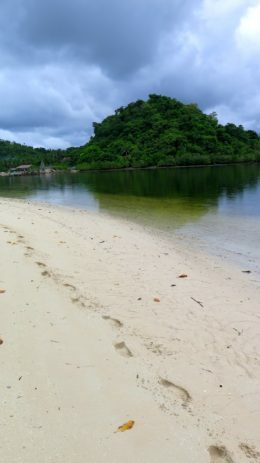 White sand beaches can be found everywhere and a worthy trip is to the Sugba Lagoon, its hidden among the mangroves and known for its turquoise water. It was no surprise when I received an email from my girlfriend in Chicago introducing me to her brother who lives on the island. We’re going to meet for dinner and dinner around here is always worth the price. 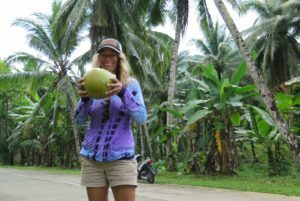 As an example (I’ll have more prices when I upload the Siargao page) dinner for two which included 4 pork chops, 2 vegetable skewers, 1 liter of soda and 1 pint of rum set us back 9 bucks and 23 cents. No I am not kidding and that was the total bill. 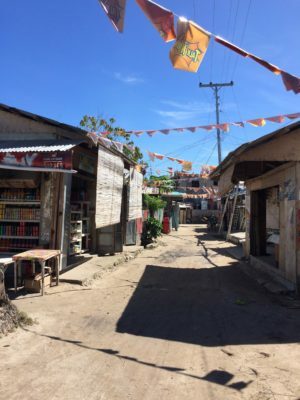 I spent a couple days exploring the island on a motorbike and the bike rental was $10 a day. Surfer or not I cannot think of one reason why a person who loves islands wouldn’t want to put this place on their bucket list. I am tempted to stay longer but I am making myself move on. 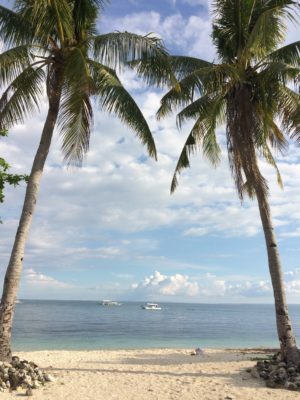 There’s a smaller island, Apo Island, which sounds a bit rustic but it is suppose to be a premier diving spot so I need to check it out before my flight to China. 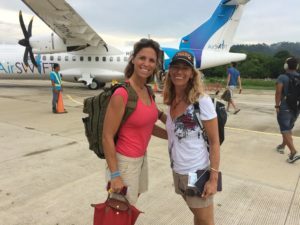 It will take me a couple of days to get there, the airlines here still haven’t figured out how to make connections for island hoppers convenient, so I need to overnight in another city along the way. Note to my family; if I go quiet for a few days not to worry the place I am going is still working on around the clock electricity but I hear the sunsets are amazing. I’ll send you some pictures when I can. It’s off to Apo Island!